The best motivation for giving is simple: gratitude. We are encouraged to give back a portion of what God has blessed us with. The TUMC congregation, with direction and support from the church board, sets priorities for how money is spent. Cash in the collection plate. Cash donations are used for the general fund, which supports all aspects of church work. No receipts are given for loose cash, but if you place money in an offering envelope (available on the mail cart in the lobby) you can add your name and receive a tax receipt. 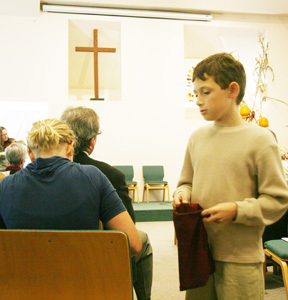 Offerings of loose change, collected in cloth bags, go to projects chosen by the Sunday School children. Cheques in the collection plate. Cheques should be made payable to Toronto United Mennonite Church. If you wish to support a current project instead of the general fund, please indicate that with a note on the cheque memo line. Donate via e-transfer. Payments can be made using the email treasurer@tumc.ca. Please indicate any special purpose for your donation, eg the Building Fund. You may use e-transfer for retreat fees and other types of payments. Preapproved payments from your bank account. By filling in a simple form you can make monthly donations to TUMC directly from your bank account. The deductions are made on the same day each month and can be designated for the general fund or for other specific projects, for example the building fund. The amounts will be deducted until you ask for them to be stopped, which you can do at any time, usually with a one-month lag before starting and stopping payments. You can access the form via this link. Donate via Canada Helps. The Canada Helps web site canadahelps.org allows you to donate to TUMC with your credit card or via PayPal. Go to the website and enter Toronto United Mennonite Church in the Charity name box at the top left. You will get a list that includes some other charities with names similar to ours. Click on the TUMC name and fill in the information. You can donate to the general fund or to specific projects and make one time or regular donations. Matching Donations. Some companies will match donations made by employees. TUMC may be eligible under such programs. United Way. Some companies allow employees to give via United Way and to designate the organization that receives the donation. TUMC can be designated to receive your United Way donations. Gifts of Securities. Securities can be given to TUMC without the need to sell them first. This may have income tax advantages. Since the process can be complex we would recommend using Abundance Canada (previously Mennonite Foundation of Canada) to help with the process. While Canada Helps and Abundance Canada issues its own receipts, TUMC receipts are issued once at the end of the year and distributed in February. TUMC accepts donations for our own spending plans projects and will also accept extra donations for external projects that we support such as Mennonite Central Committee or Mennonite Church Eastern Canada. If you designate a donation to one of these organizations the money will be sent to them and you will get a TUMC receipt but the money will not be counted towards our spending plan commitment. Currently besides our general fund we are accepting money towards Aurora House, building fund, refugee fund, youth projects, special needs fund and a memorial fund. Look for write ups on these funds in Place of Meeting issues. TUMC does not accept donations meant for non- Mennonite causes we do not support. Providing for a place of worship and community (facilities, materials for worship and Sunday School, etc.). Providing for those who serve the church (salaries, allowances, and benefits for staff).